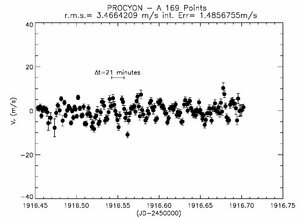 SARG, the high resolution optical spectrometer of TNG, has once more proved its exceptional stability and capabilities by delivering one of the most accurate measurements of solar-like p-mode oscillations in a star. The results, which are briefly summarized below, will be presented in details in a forthcoming paper by Claudi R., Bonanno A., Ventura R., Desidera S., Gratton R., Endl M. & Leccia S.
The F5 IV - V sub-giant Procyon was observed over six nights with SARG at the beginning of 2001 during its very first approved guest program. We took sequences of ten seconds exposures with an average dead time in between of 127 s. In total, 956 spectra (R=144,000) were collected with a typical signal to noise ratio ranging between 250 - 330. Data reduction was performed using IRAF tasks devoted to echelle spectra. 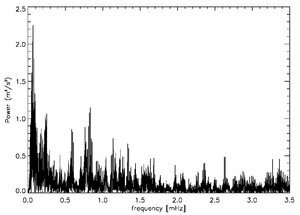 Successively the modeling of the star plus iodine absorption spectra was performed by using AUSTRAL code (Endl et al. 2000, A&A, 362, 585) in order to obtain the radial velocity time series. The single points of the Doppler shift measurements have an r.m.s. internal error of 1.68 m/s. As shown in Figure 1, in some time series we obtain an internal error of 1.5 m/s and the 21 minute pulsation is clearly visible where there is not negative interference with other pulsation mode. 1.5 m/s. The 21 minutes pulsation is clearly visible. The Scargle and Lomb modified periodgram shows a power excess around 1mHz. The overall shape of the excess power is not symmetric and does not have the typical bell-like envelope of the solar oscillations. This can be explained by the effects of gaps and/ or noise and amplitude modulation that are intrinsic to the star. Fig. 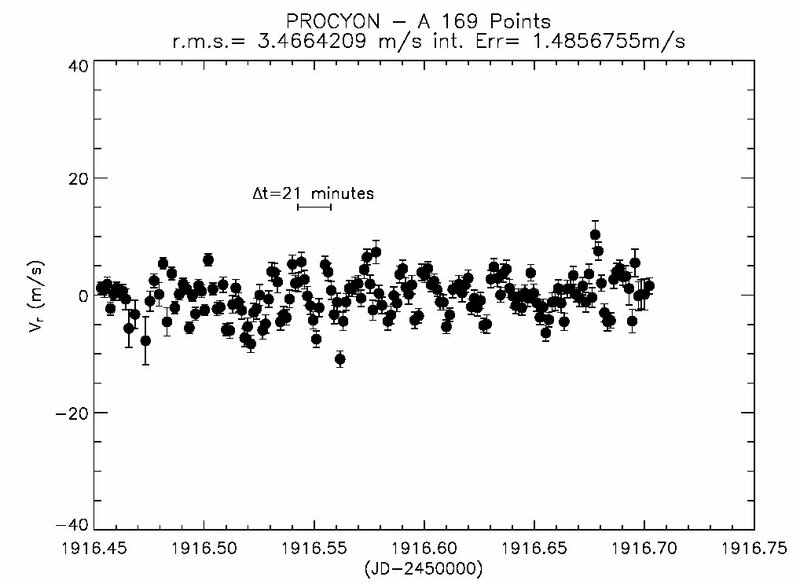 2 Power spectra of the SARG Doppler shift measurements (six nights) of Procyon A. The higher power frequency corresponds within the observational error (2 µ Hz) to the 0.7787 mHz identified by Martic et al. (2004 astro-ph 043035) as np=-1 and l=1 mode. The analysis of the modes is in progress.